Nate, enormous bowl of (dry) Cheerios in lap, chowing down. Nora Kate, whining steadily, holding out her hand for him to drop Cheerios in one by one. Me: (dryly, every 5 seconds) "Nate, give your sister a Cheerio. Nate, seriously, just give her ONE (damn) Cheerio. Nate, come on, share. NATE." This one apparently talks out his eye. ohhhh siblings. they are the best and THEY ARE THE WORST. YES. last night parker had a conversation with his veggie straws at dinner. they had names and everything. hah.. Nice. I love the (damn) cheerio comment. I've got to get me some kids. Or, maybe just Cheerios. I'm undecided. 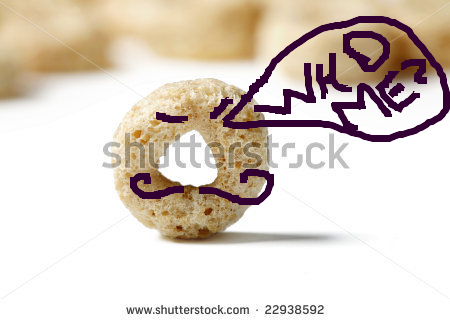 I keep envisioning the cheerio doing an evil laugh. I hope I don't have nightmares about him tonight.